Sojourn Exploration Inc (TSXV:SOJ) (previously Sojourn Ventures Inc) holds two properties in British Columbia, Canada through an option agreement with Millrock Resources Inc: Willoughby and Oweegee Dome. These properties are both situated on the eastern border of the Golden Triangle region located in the northwest of the province. The Golden Triangle is a remote and mountainous area of British Columbia which sits on the border of Alaska’s panhandle. Interest in this area has existed since the second half of the 1800s and it is renowned for significant findings that took place in the 1900s including the Eskay Creek and Snip deposits. While the Golden Triangle was previously hindered by a lack of infrastructure and a heavy glacier presence, recent developments in infrastructure including roads and power lines as well as receding glaciers have inspired new exploration initiatives. Thanks to new infrastructure, new discoveries in the area, higher gold prices and maturing production, the Golden Triangle is stepping into a new age of growth and production. Sojourn’s primary focus as a company is to increase shareholder value. They do this by implementing a ‘prospect generator’ model, which adds value to their portfolio through the acquisition of properties, by enhancing historical results through further exploration and with an ongoing search for joint venture opportunities for the development of those properties. Preliminary exploration initiatives have recently been announced for both the Willoughby and Oweegee Dome properties. With a strong foundation of historical data, the goal of this exploration is to follow up on historical results and further determine target areas for drilling in 2018. The Sojourn management team is made up of a collection of finance and mining experts with vast experience in overseeing projects and improving shareholder value. Strong focus on creating value for shareholders by increasing the value of properties and entering promising joint venture opportunities. Two prospective gold projects in a profitable jurisdiction in Canada ranked in the top 30 attractive mining investment regions worldwide by the Fraser Institute. Golden Triangle, historically a prominent region for mining and exploration activity, is witnessing resurgence resulting from new discoveries and improved infrastructure. Both projects have seen significant historical work that shows promising potential. Historical exploration at the Oweegee Dome property shows 0.189 g/t gold and 0.074 percent copper over a 138.67 meter core length. Management team members each hold a significant number of shares and Millrock is a strategic shareholder with 1.8 million shares in the Willoughby property. Experienced team of investment and mining executives with over 200 years of collective experience. In June 2017 Sojourn entered into option agreements for the Oweegee Dome and Willoughby properties held by Millrock Resources Inc, which entitled them to earn 100 percent on these properties. These projects are both located on the eastern border of the Golden Triangle region, northeast of Stewart, BC, supported by access roads and close to Highway 37. Exploration initiatives in both properties began in August 2017. Sojourn’s objectives with these properties include enhancing their value and exploring potential partners for the development stage of the project. The Golden Triangle is in the northwest of BC, 100 kilometers inland from the Alaskan panhandle. Interest in the region began in 1861, when placer gold was discovered, instigating the Stikine Gold Rush. The region is well-known for its bountiful precious metals. Gold, silver and other mineral mines have existed there since 1918. There have been a number of key discoveries in the area including the Snip deposit in 1964, which produced 1.1 million ounces grading an average of 27.5 g/t gold, and the Eskay Creek discovery in 1988, which totaled more than 3 million ounces of gold and 160 million ounces of silver. Over the past decade, vast improvements in infrastructure as well as rapid melting rates in the glaciers have both vastly improved access and offered new drilling opportunities. Willoughby is a 995-hectare property, located in the southernmost tip of the Golden Triangle and 26 kilometers east of Stewart, a town with a year-round ice-free port. The property is a high grade gold and silver prospect with noted similarities to both the Red Mountain deposit, located only seven kilometers west, and the historic Silbak-Premier Gold Mine. The primary period of drilling on the Willoughby property was conducted between 1989 and 1996. This included two phases of diamond drilling, 74 surface holes totalling 8,181 meters, 30 underground holes totalling 2,383 meters and focused on four zones: North, Main, Willoughby and Edge. 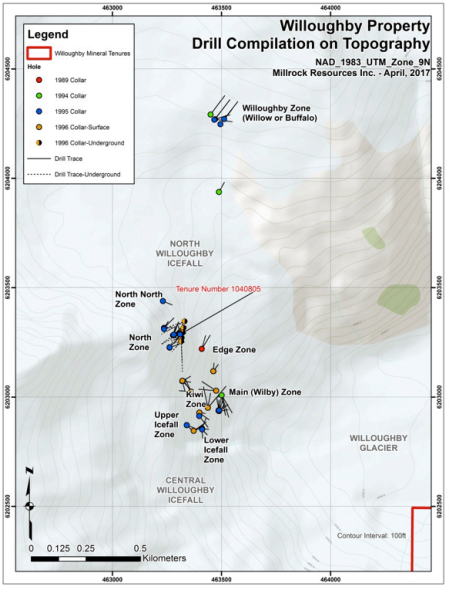 Exploration discovered that within the Willoughby property, composed in part by Lower Jurassic Hazelton Group pyroclastic rocks, there are two types of gold and silver bearing sulphide mineralization. Since 1996, there has been little exploration work done on the property. During this time, however, the presence of glaciers in the region has decreased significantly, exposing a potential for new mineralized zones that could be explored. Understanding the need for further exploration on the property, a two-stage program has been planned and is in the process of being launched. The first stage includes using historical results to develop a 3D model that will further determine mineralization trends on the Willoughby property and would use detailed mapping to encourage the prioritization of drill targets. The second part of the program is planned for2018 and would include conducting drilling as a follow-up to historical drill programs and any data gathered in the first stage. 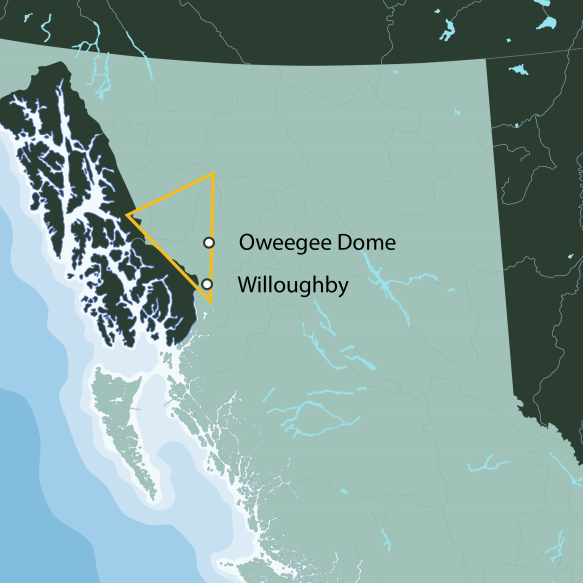 Oweegee Dome is a 31,238-hectare property, due north of the Willoughby property and 74 kilometers away from Stewart. The property is also crossed by the Northwest Transmission Line and is supported by five access roads that lead into one of the target areas. The property is composed by Hazelton Group rocks, bordered by Browser Lake Group sediments and is found in a region known as a promising geological environment for the formation of significant metal deposits in proximal Hazelton Group rocks. There have been numerous exploration activities on the property, resulting in a wealth of data. This historical exploration has determined three primary exploration zones (DC, South Meadow and Delta West) that show great potential. The DC zone has undergone ground surveys, airborne geophysics and drilling that point towards the presence of a gold-copper porphyry system. Historical drill results include 0.189 g/t gold and 0.074 percent copper over a 138.67-meter core length. This included a higher-grade gold section containing 0.468 g/t gold and 0.11 percent copper over 17.14 meters and a higher copper section of 0.140 g/t gold and 0.17 percent copper over 17.08 meters. The South Meadow zone has been explored through ground surveys, airborne geophysics and limited drilling which showed gold and silver rich VMS that is genetically related to porphyry. Lastly, the Delta West region showed zinc, gold, lead and copper VMS which was discovered through ground surveys and airborne geophysics. 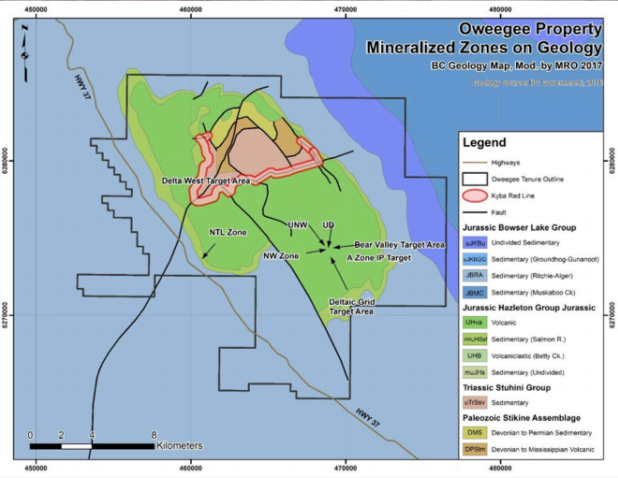 Oweegee Dome is currently undergoing a Phase 1 exploration project aimed at further evaluating targets identified to date and recommending drill targets for the next phase of exploration. Like in the Willoughby project, a drilling exploration campaign is expected to kick-off in 2018. Tim Henneberry brings over 37 years of expertise in mineral exploration, production and development of precious and base metals and executive management with public companies to his role at Sojourn Exploration. Henneberry worked in Western and Northern Canada, Southwestern United States, Africa and South America. Prior to joining Sojourn, he was a founding Director, President and Chief Executive Officer of Appleton Exploration Inc (2006 to 2011) and Indigo Exploration Inc (2009 to 2011). He is a past Director of Broadway Gold Mining Ltd. He is currently a Director of Quadro Resources Ltd, and on the advisory board of Anfield Resources Ltd, Canadian Zeolite Corp, and Tasca Resources Ltd.
John Meekison is a career Chief Financial Officer and investment banker. In addition to Meekison’s role as CFO of Sojourn, he is the current CFO of Segra International Corp, and Evans and Evans Inc. Additionally, he has over 15 years of experience raising equity capital for public and private companies at Haywood Securities and Cantor Fitzgerald (formally Dlouhy Merchant Capital). Brien Lundin is the President and CEO of Jefferson Financial Inc, a producer of investment-oriented events and publisher of investment newsletters and special reports. Lundin is also the publisher and editor of several investment publications, and is the operator of the New Orleans Investment Conference. He is Chairman, Director and a co-founder of Natcore Technology Inc, a solar technology company, and a Director of Thunderstruck Resources Ltd.
Don Lay is the President and CEO of Medallion Resources, a public-venture rare-earth metal processing company. Lay has spent close to 30 years in public and private venture capital and international business. He has served as a senior officer and director for a number of public and private resource and technology companies. Before entering the start-up world in 1994, Lay focused on development and sales in the enterprise software industry. Joel Dumaresq is the CEO and Chairman of Molori Energy Inc. He is also the co-founder and a Managing Director of Matrix Partners Inc, a Canadian private-equity and merchant banking group. Prior to the establishment of Matrix Partners Inc, he was the President of Greenwater Forest Products, and worked in investment banking and financial services with RBC Dominion Securities from 1985-1995. Greg Beischer is a geologist and mining engineering technologist, and a seasoned and skilled explorer of BC’s northwestern terrain known as the Golden Triangle. Beischer is the current President and a Director of Millrock Resources Inc. He was previously with Vale (formaly Inco Limited) and the Bristol Bay Native Corporation. He is a certified professional geologist (#10505) with the American Institute of Professional Geologists. He is also the past President of the Alaska Miners Association, and serves on the Alaska Minerals Commission. *Disclaimer: The profile provides information which was sourced and approved by Sojourn Exploration Inc in order to help investors learn more about the company. Sojourn Exploration Inc is a client of the Investing News Network (INN). The company’s campaign fees pay for INN to create and update this profile page, to which links are placed on Investingnews.com and channel newsletters. By completing this form, you are giving consent to receive communication from Sojourn using the contact information you provide. And remember you can unsubscribe at any time.